The following map was prepared by the National Weather Service in Fort Worth and is a graphical representation of over 200 reports gathered via social media, storm spotters, and official observers. I will gather additional information that will hopefully provide additional details/specifics. All updates starting with my initial forecast are in chronological order from the bottom up. 1) Sublimative cooling from the falling snow will cause the temperature to fall into the lower 20s this morning (mid 20s from Dallas eastward). 2) Roads, especially bridges and overpasses, will freeze at temperatures below 27º. 3) Typically, the snow initially melts on impact with the road (they will look wet), but the microphysics of melting snow causes the temperature of pavement to drop to freezing. Then, the air temperature in the low to mid 20s forces them to cool *below* freezing. Roads (especially secondary roads, bridges, and overpasses) can freeze within just *two* hours after the snow begins when temperatures are below 27º. 4) This event was VERY-well predicted a couple of days ago, with excellent precision and accuracy, in terms of amounts (1-3″), timing (mid-morning), and temperatures in the 20s. 5) Today’s high temperature has already occurred. We have broken the record for the coldest February 27th on record (dating back 116 years to 1899; previous record was 33º set in 1942 and 1965). 6) We will likely break the daily snowfall record (believe it or not, there has never been more than 1/2 inch on any 2/27 at DFW since records began). 7) Significant snow accumulations of 1 to 3 inches will be widespread, some areas up to 4 inches. Freezing drizzle tonight. 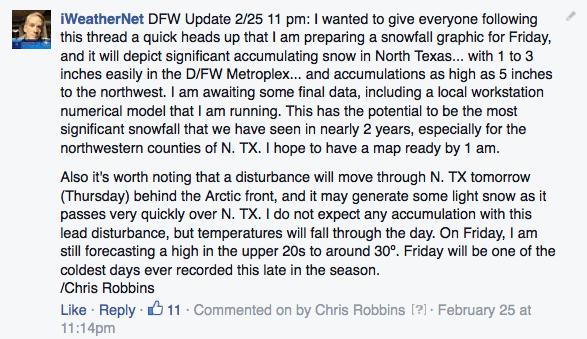 I have consistently predicted 1″ to 3″, with the lowest amounts from Dallas east/south, highest to the northwest. 8) The snow intensity will be greatest between now and 4 pm, then taper to flurries. Convective elements will generate heavier snow, up to 1 inch per hour in the heaviest bands, along with gusty winds. 9) Tonight, a warm layer will develop aloft. Warm advection will generate freezing drizzle and light freezing rain, forming a glaze of ice on all exposed surfaces. Ice may accumulate up to a tenth of an inch tonight. 10) We will not rise above freezing until noon tomorrow. 11) Warming trend will get underway *tomorrow night*, with RISING temperatures during the overnight hours, reaching 40º by sunrise Sunday. 12) We will be in the 70s by Wednesday ahead of an Arctic front, with highs next Thursday (3/5) only in the 30s. Stay safe on the roads if you’re out and about (it gets worse tonight when freezing drizzle develops). Update #2 Friday 2/27 6:20 am: Overnight, snow developed and increased in coverage rapidly, and is moving toward North Texas as predicted. The radar will be a little deceptive this morning. The leading edge of the snow is sublimating before reaching the ground because the surface layer is very dry. I have drawn a *very* approximate line representing where snow is reaching the ground based on some observations. I still believe the snow will enter the western part of the metroplex by 8 am and DFW Airport to Dallas around 9 am (give/take). If precipitation intensifies ahead of the white line, there could be a slightly earlier onset time. But for now, it looks like the morning commute through 8 am will be dry. Snow will envelope the entire metroplex this morning, and last through early afternoon. I am still forecasting 1 to 3 inches, with even larger amounts to the northwest (as depicted on yesterday’s snowfall map). The temperature today will not rise above freezing. In fact, we will stay in the 20s most of the day. We will have a lull in precipitation later this afternoon, but freezing drizzle will develop tonight, causing a glaze to form on roads (on top of any snow that’s already on them). This will be a very messy/icy 30-hour period, as we will NOT rise above freezing until tomorrow afternoon. If you have the option, today would be a good day to just stay home and watch sitcoms. Here is a snapshot of the radar at 6:15 am. February will end on a cold note here in North Texas. Unseasonably cold air has moved into the state, and my 11:18 pm EST (Thu 2/26) partial surface analysis reveals a secondary, reinforcing shot of Arctic air moving toward the DFW Metroplex. 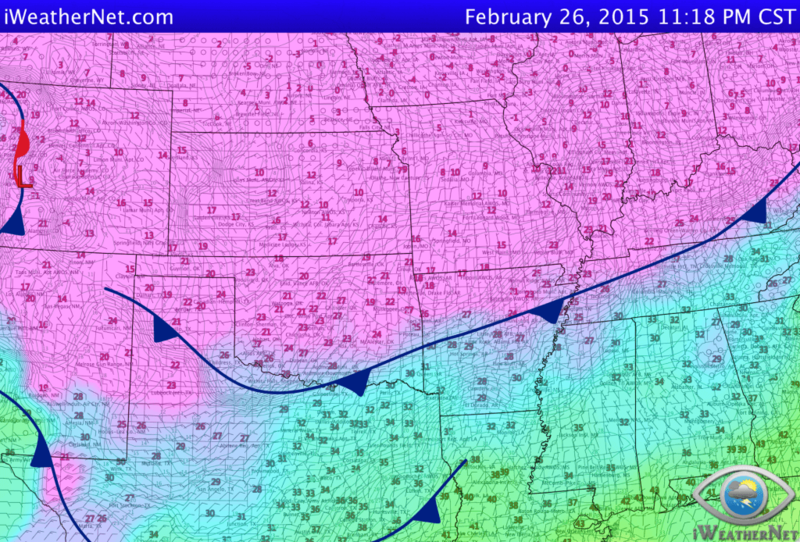 With this reinforcement, temperatures on Friday (2/27) will stay in the 20s to around 30º all day. The high temperature on Friday (2/27) may break a record for the coldest high temperature ever recorded on the date. At the time of this post, the secondary front was just crossing the Red River, and will move through DFW overnight. It’s worth noting that another front moved though last night, and that kept our temperatures in the 30s all day today. Tomorrow will be much colder. Take notice of the bitterly cold temperatures across the Central and Northern Plains, stretching east through the Midwest. Posted Thursday 2/26: A disturbance moving across North Texas on Friday will generate snow. The snow will develop across far West Texas late tonight, and increase in coverage as it moves east toward D/FW. The lower levels of the atmosphere are quite dry, so some of the initial precipitation will likely sublimate before reaching the ground. The following image shows my preliminary snow accumulation forecast. I have made an attempt to be as conservative as possible, to give a realistic expectation based on North Texas’ snowfall climatology. One thing that concerns me is that there appears to be some conditional instability in the atmosphere Friday morning, which could generate some convective banding. If that happens, there will be locally enhanced areas of snow, with larger accumulations. If necessary, I will bump the precipitation amounts upward with future data. Please bookmark the page so you can see the latest developments (all updates will be appended to the top of this page). When forecasting for a large area, sometimes the best way to explain the progression of a snow event is by showing reliable animations. I rarely show model data (certainly not on social media), because a forecast requires a preponderance of all data, not just a single model. However, I feel that this particular solution will be reliable and is worth showing for this event. 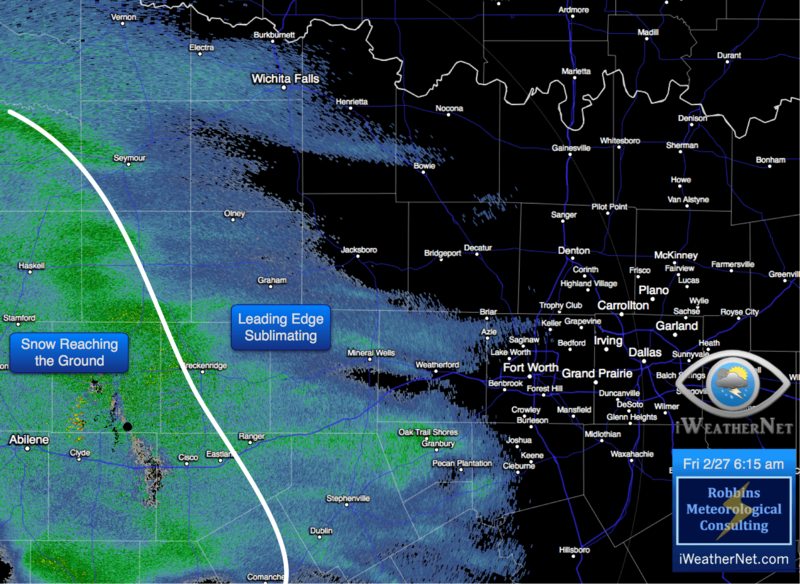 The snow will enter from the southwest after sunrise… likely approaching DFW Airport by 9 am. It will be wise to plan your morning commute based on the arrival time of the snow. Be sure to check the radar first thing in the morning. Temperatures will be in the 20s at sunrise and the snow will accumulate efficiently, especially on untreated roads. Temperatures will stay in the 20s to around 30º all day Friday. An Arctic front will surge into North Texas tomorrow (Thursday 2/26), with gusty northwest winds 20 to 30 mph, and falling temperatures. Wind chills tomorrow will be in the 20s. A disturbance moving across North Texas on Friday will generate snow, developing initially in West Texas, then spreading eastward into North Texas throughout the day. 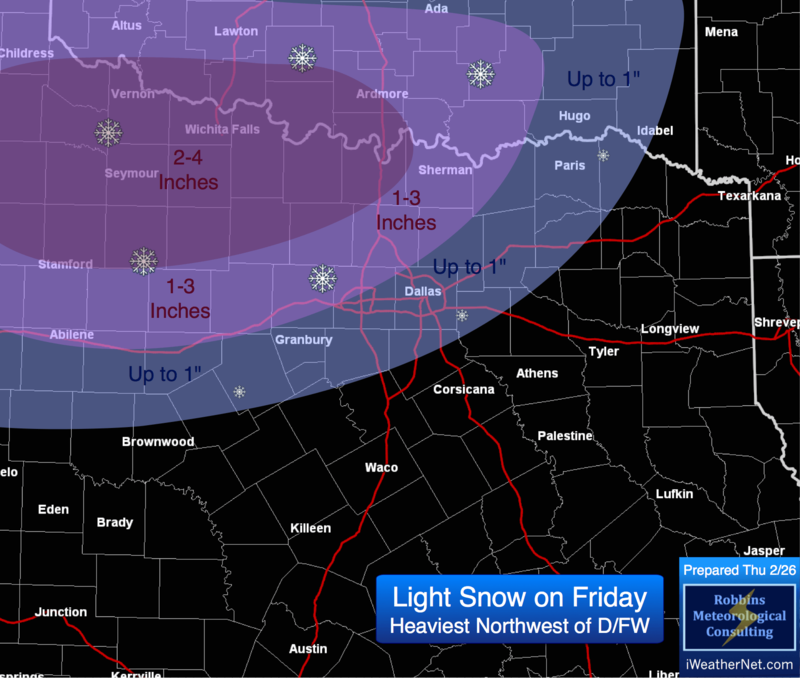 At this time, it appears that snow may accumulate 1 to 3 inches on Friday in North Texas, including the D/FW Metroplex. Temperatures on Friday will NOT rise above freezing. In fact, temperatures will stay in the 20s most of the day. I will post updates as the storm evolves. We are in a very active weather pattern, and it will not relent just yet. A Winter Storm Watch or Winter Weather Advisories may eventually be warranted. Check back for future updates.